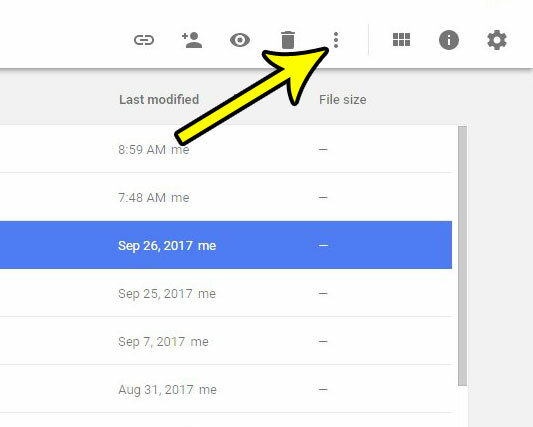 When you initially name a document that you create in Google Docs, you might do so with the understanding that no one will see that document name. Or maybe you begin typing a document with a specific purpose in mind, only to find out later that the document was better suited for something else, or that it was needed for a different purpose. 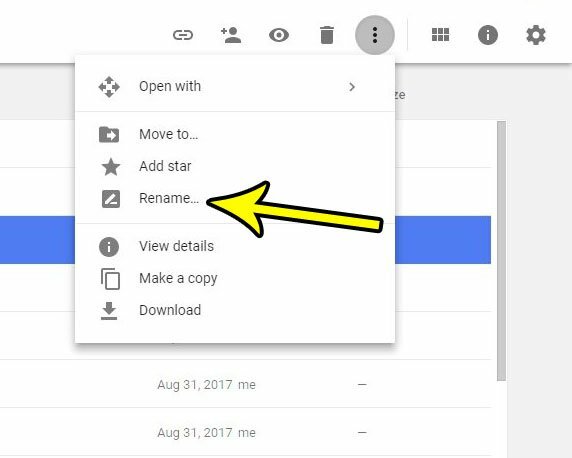 As you create more and more documents in Google Docs it can become difficult to find the right documents without a strong naming convention. 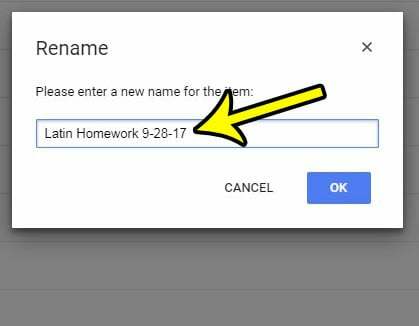 Fortunately Google Docs makes it possible for you to change the name of an existing document if you find that the current name is not something that is helpful to you. The steps in this article were performed in Google Chrome. Completing the steps outlined below will cause you to change the name of an existing document in Google Docs. Step 1: Open your Google Drive at https://drive.google.com/drive/my-drive and click the existing document that you would like to rename. Step 2: Click the More actions button (the icon with the three vertical dots). Step 3: Choose the Rename option. Step 4: Type the new name for the document, then click the OK button. Does your school or job require page numbers for the documents that you submit? Learn how to add page numbers in Google Docs so that you can adhere to the formatting requirements of your institution.